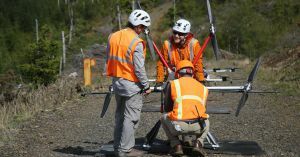 That’s why a Seattle-based startup has come up with a high-tech solution to the problem of planting seeds in areas devastated by wildfires — and it involves a combination of drones, artificial intelligence, and bioengineering. Every year, wildfires in the U.S. burn an average of 7 million acres, and our current method of replacing lost trees isn’t exactly ideal. “Even at the most sophisticated companies in the world, planters are superheroes that use bags and a shovel to plant trees,” entrepreneur Grant Canary told TechCrunch. That’s why he founded DroneSeed in 2015. The company has developed drones capable of both deciding where to plant seeds and actually planting them — two tasks previously carried out by humans. The drone uses lidar to create a 3D map of an area and a multispectral camera to gather details about its soil and vegetation. From that data, an AI model determines the ideal spot to plant a new tree. The drones don’t simply throw seeds at the ground, though — DroneSeed has developed special “seed vessels.” These are small pucks of nutrients with a seed at their center and a dusting of capsaicin on their exterior to deter animals from eating them. DroneSeed is the first company to receive a multi-craft, over-55-pounds unmanned aerial vehicle license from the Federal Aviation Administration. That means its drones can work in swarms of up to five crafts to cover larger areas. The company has already tested its tech with nonprofits and U.S. timber companies, and it plans to kick off its first commercial post-fire restoration project in December. Eventually, it could help us ensure that we’re able to plant news trees at least as quickly as we lose them — and given the fact that wildfires are growing both more common and more destructive, the tech couldn’t come at a more opportune time.